The move is done; my kitchen is about put together but the rest of the place is a disaster. Boxes both filled and empty everywhere the eye can see. I’m weary beyond belief but in a good way; hard physical activity weary is much preferable to stress weary, right? I had a great, simple dish I wanted to share today but instead I’m bringing this one out of the archives for two reasons….wait, three. First, I can not find the book on honey with the recipe for a simple green bean dish with a honey dressing. I’ve only got a bazillion boxes of cookbooks (along with an equal number of boxes of booze!) and they are scattered everywhere…so that one will have to wait a bit. Second because my salad craving culminated in having this Spinach Salad with Mozzarella, Pears, Pine Nuts for dinner last night I wanted to share it again because it is such a favorite and third? Zero degree temps and 5 inches of new snowfall and I want to be reminded of warmer months ahead and hopefully my re-creating a beautiful garden here too! I just love this combination of ingredients; I could honestly eat this salad for days on end and be happy. Pine nuts too pricey (YES!!) then substitute with walnuts; toasted walnuts are a new-found favorite of mine and would be great too. 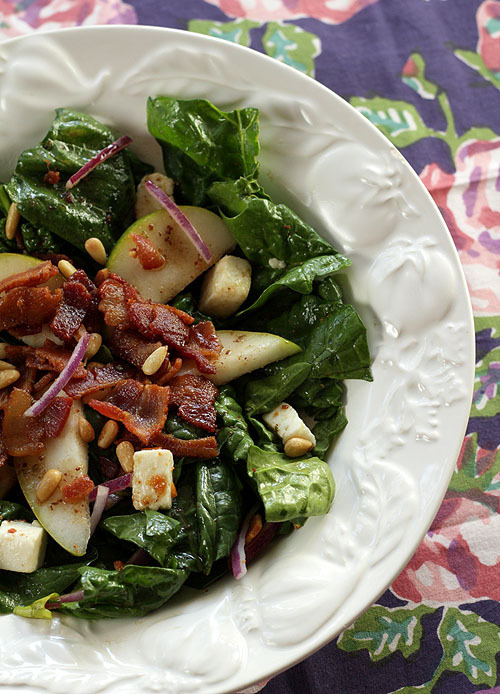 Spinach salad with pears and bacon was a no-brainer. Though not my home cured version of bacon (sob), I had some good bacon in the freezer and even if I prefer my Maple Bourbon Bacon on an ongoing basis, I wasn’t going to pitch a perfectly good pound of pork. Bacon means some bacon fat so I decided to try combining components of my favorites for spinach; elements of a honey mustard dressing with those of a warm bacon dressing and I thought it was sounding good. It was late, I hadn’t had lunch so sometimes you never know…sounds good could just mean I was REALLY hungry! I was certainly putting together a lot of familiar components and heading in a very familiar direction. Should I officially christen this an Italian Spinach Salad? I did combine olive oil with the bacon fat too…while not on a list for the healthiest of salad dressings, I thought that at least helped. I’m also using pine nuts, my very last precious cache of them from happier times. When I could afford them. Before their price started to rival gold. I hear it’s due to a shortage though I see plenty of them; they are just double the price I used to pay (and they were already a bit pricier than other nuts). I’m not anxious to pop $20 for a bag of them at my local Costco so I’m playing a waiting game though I read the other day it might be a long wait. Like forever. If you don’t have pine nuts and don’t want to take out a 2nd mortgage on your home, then toast some pecans or walnuts; that’s what I’ll be doing in the future too! This was a simple salad with the freshest of ingredients and I’m excited to be dining outdoors tonight where my garden is in the throes of glory. So I thought I would share some of that with you today. Wish you could join me! Spinach and pears are combined with fresh mozzarella and pine nuts for a new take on an old classic. Put spinach leaves and red onion slices in a bowl. Mix vinegars, honey, mustard, salt, and pepper together. Add bacon drippings and oil and whisk until blended. Toss the ingredients in the bowl with some dressing to lightly cover. Salt and pepper to taste. Plate each serving and arrange pears on top. Add mozzarella, bacon and pine nuts to each serving. This makes additional dressing than what will be required for 4 servings. Serve with any fresh salad. Barb this salad looks delicious. Totally in salad mode at the mo and this one looks perfect. Although I have to say I’ve metally replaced the mozzaella with a hint of cheeky blue cheese! Totally with you on pine nuts, they are rediculously expensive! Defo will be giving this one a try. So glad you finally arrived at your destination…..I don’t envy you these last steps, but I can’t imagine the boxes will be around for long. Good luck with them! Yummy recipe, BTW! Me too! You’re right; nothing to envy; flat out exhausted and want to stop but can’t. I am going to try and hear the words of my friends who know me too well and not feel it has to get done by this weekend though! This is just the right salad for me. Bookmarked! I remember a similar salad Greg; think ours had some hard boiled egg in it too? I’m getting settled and loving it. The simplest act of just vegging in front of TV with my dog and a glass of wine has been impossible for most of the year. Simple pleasures are all I need! HNE to you too! I know that feeling of having the kitchen put together and nothing else. It must still feel terrific to be in your own place with your own personality and signature. I can’t wait for photos. All I want in this heat are salads and this one looks really good! I love using spinach as a base for salads. And I agree that fruit and nuts make a perfect pairing for spinach salads. 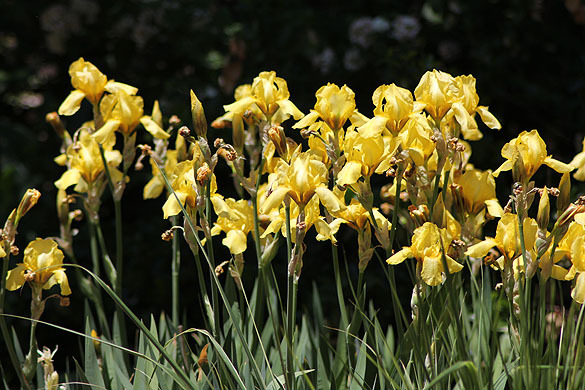 Ah….Your garden looked gorgeous and what a fine time to remind us that Spring isn’t too far away. The salad looks very tempting and I am so partial to spinach salads with bacon dressing. And just so you know-I would be very happy to split a bag of pine nuts with you. That price has had me holding back, too! Glad you are getting settled. It looks like that photo room is working out awfully well! Gorgeous gorgeous salad! Glad you are getting settled in. Barb..I have to say that this salad is gorgeous!! I just know that all of those ingredients put together are a fabulous combination, and I cannot wait to give this one a try… I love the dish, I love the salad, I love the tablecloth!! Everything about this is perfect. I’m glad you got the most important room of the house put together!! 🙂 I’m happy to come and empty a box! Ha.. I can’t ever find my measuring cups, they’re never a full set…and I can’t figure out what I do with them, and where they go! And I’ve been living in my house for 20 years!! What an absolutely lovely salad, Barb! Makes me think of spring while I shiver and shake with my hands wrapped around a cup of hot cocoa. I’m just delighted that you’ve moved into your new home and are starting to get back to a normal life. A very Happy New Year to you! Yes, normal…not sure anymore what that is but if it means less drama and heartache well I’m in the mood and determined to make that happen! Appreciate your friendship through all of this. Glad you’re in your new house! As long as the kitchen is mostly together, the rest can wait. I can live in clutter for a bit just as long as I have something decent to eat! Like this wonderful salad. It’s cold here (subzero) and snowy (about a foot), so springtime sounds really enticing. Thanks for this. I’m glad too John, it’s been a long time coming. Now to only have a fairy Godmother or my own wand to get all this stuff put away. It feels like for every box I unpack that two more appear. Except of course the ones with the stuff I REALLY want to find! Still; it’s great to be in my own home again; in my own kitchen again. I’ve missed that a lot! Congratulations on your new home, Barbara. I can sense the serenity in your writing and wish you all the best. Moving is a HUGE burden, but so worth it, once all the boxes are unpacked, especially the kitchen and the treasured cookbooks. Happy new year and thanks for a great recipe. Oh spring, where are you? I like your glimpses of brighter weather, although I can’t complain much about this weather. Denver winters are crisp, clear and sunny which is far better than the icy stuff I grew up with out East. I am SO happy you are settling in to your new home. May you enjoy many happy meals there! Looks beautiful! I don’t blame you for bringing this one out of the archives. So glad you got the move done. Don’t get too stressed about those boxes, they aren’t going anywhere! Exactly. I wish they would all disappear about now! I’ll be lucky today if I just get the paper into bags and the boxes broken down; my hallway says it’s time! Thanks again for your help; so appreciated my friend. You are so right when you say physical activity weary is so much better than stress weary. I’m so happy for you that you finally have the keys to your home and that you settling in. I can only imagine how happy you are. Could not have started off the New Year any better! I had a delicious pear and spinach salad while we were in B.C. this past September. It was heavenly and I have made it a few times at home since. One of my favourites. I love the look of this version with the added bacon and pine nuts. Will be making this one for certain. Enjoy your new home Barb, may nothing but happiness and new friendship cross your entryway. Thank you sir; appreciate the very kind comment! Stumbled this is screaming my name! If we lived closer, I’d offer to go 50/50 on a box of pine nuts with you. Because seriously, they’re $$$$$$$$$$$$. Isn’t dining in the garden THE BEST THING EVER????? 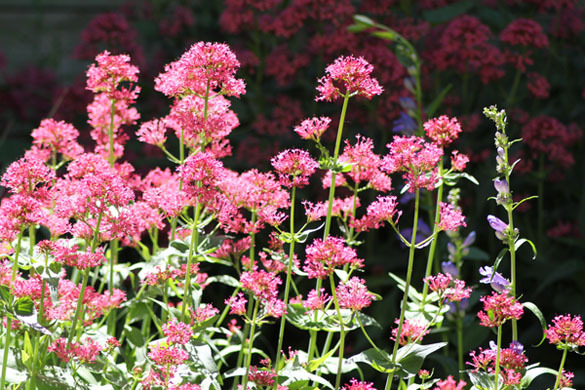 Thanks Kim…my days of what you and Barry do are over but I do love the flowers and herbs. My outside dining in the evening has been totally ruined by having to have a tree cut down. The leaves were all gone but it’s now evident that the trunk was in the path of the sun and now my entire covered patio is in full sunlight from 4p to 6p (luckily the neighbor behind us is up high and blocks sun from 6p until sunset). I’m installing a matchstick blind on the edge of the porch today…it’s only been a couple of days but I can’t wait to eat dinner out there again tonight! 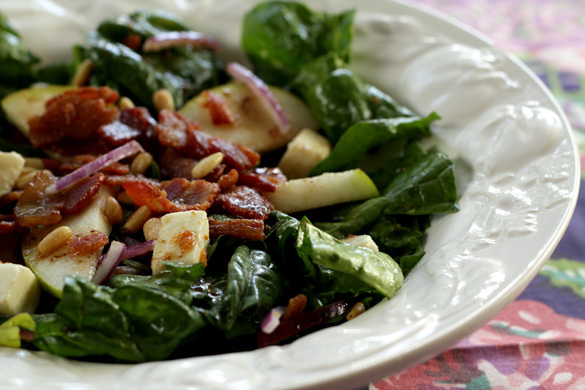 Warm bacon dressing is how I got hooked on eating spinach salads when I was a teenager, although I never considered adding pear to the mix. I’m quite jealous of your garden. We do get some flowers that are heat-tolerant but I get tired of them rather quick! Me too Megan…used to be my absolute favorite salad. I never liked cooked spinach and was so pleasantly surprised at the notion of eating it fresh…with a great dressing! Most of mine have to be drought tolerant. I only water the grass and annuals. If they can’t stand the heat/dry…they are booted out of the garden! Lovely photos of your back garden Barb. This salad looks so good. It kind of reminds me of my mother’s wilted salad, yum. I’m like you, I prefer to wait out those high prices. I had to do it a couple of years ago when vanilla extract was sky high but it’s finally back down and I am a happy baker once again. Like salmon I fear they will never come back down. I have about an eighth of a cup left. Need to save them for something stupendous don’t I? Love the looks of this salad! All the ingredients make me want to try it soon! Please do try it and make sure you let me know if you liked it as much as I did, OK? How refreshing and healthy the salad look! 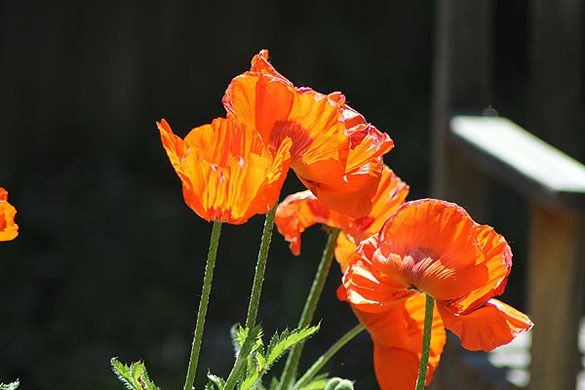 The pictures of lovely flowers making it more delightful. Thanks so much for your kind comments! Love all the colours in your garden. 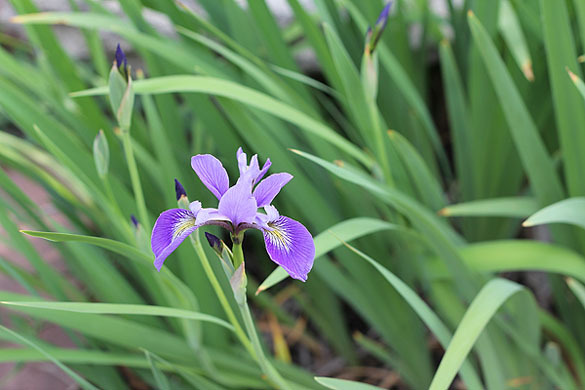 We have the iris’ growing wild on the country road along the Blueberry Marsh where I walk Max every day. Love them and while the blooms don’t last long, they certainly are beautiful in their deep purple. Me too Paula…I never liked cooked spinach as a kid and was astounded the first time I had a spinach salad. Love them in all forms…but like you, can live without the cooked version. 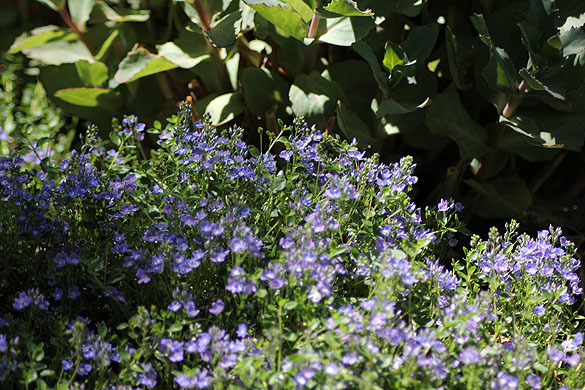 The garden has just been a riot of color…considering I never stepped one foot (good or bad!) into it last year, I’m pleased that it’s not dead! That’s a yummy looking salad … and your garden is heavenly… I’d love to sit outside and just take everything in …. 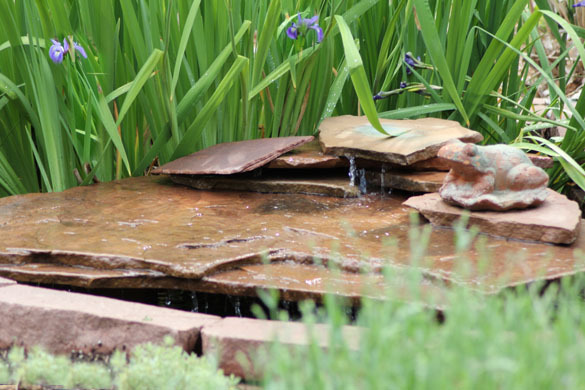 gorgeous flowers, a peaceful fountain … what else could you want when you’re looking for some solitude and peace ?? I am out there a lot I must admit. I work from home and this time of year I am so glad I do. Coffee breaks? Outside. Lunch? That too. Dinner? Of course! Woman after my own heart. Bacon it is Nelly! Your garden is lovely, but I am really taken with this salad. I get in such a rut with salads and can use all these wonderful ideas. The flavours here are wonderful and I love that you used a little bacon fat in the dressing. Yum! I got out of my rut better when I opened my mind to fruits in salads and they’ve become my preference now. Maybe with the perfect summer tomato I would revise that plan…but those are so limited during the year and the other ones are so bad! So jealous of your garden. It is gorgeous. Any meal is made better by that lovely scenery. Salad looks incredible. I had no idea pine nuts were that expensive. I’ll have to look to see what they cost around here. This salad looks incredible. Yesterday, the pine nuts were $23 at our Costco!!! They were $20 the other day and that is a bit lower than last time I checked a couple of months ago. I do love them and in truth…I’ll probably buy more but I will curtail their use a bit. Lived for years without them and now don’t know how I can live without them! What a perfect summer salad! Thanks so much…so perfect I now wish I had some spinach in my garden. And, well, a pear tree! This salad looks so delicious..and your garden is absolutely gorgeous!! Thanks on both counts…as much passion as I have for preparing food; it’s shared with one for gardening. I love the hard work and the hard earned results. Looks yummy! 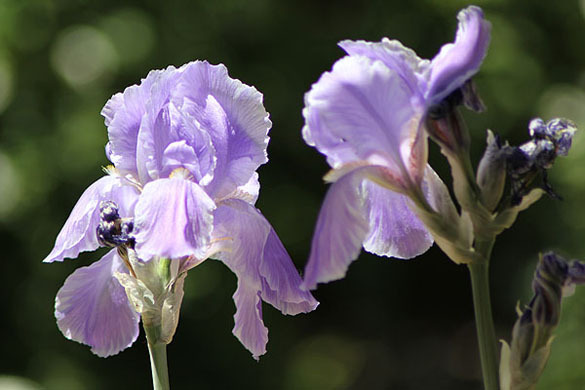 And I LOVE the flower pics – lovely! Thanks Michele..though I would love a wide angle to get the entire swath of garden, I’m sure having fun with the up close and personal shots. This salad looks so good and I can’t ever pass up a salad with fruit, bacon and pine nuts. Can’t wait to try it. Thanks so much and neither can I…seems something like this is becoming my go to salad. Blame Nordstrom’s where I got started with pear, candied walnuts and bleu cheese and never looked back! Not sure which I like more, the salad or your flowers! Thank you! A 20 year labor of love, this year has been pretty amazing. The best of both worlds is eating a fresh salad while sitting outdoors in the garden. That dressing sounds wonderful. It reminds me a bit of a warm potato salad dressing. I love the idea of putting it with spinach, cheese, nuts and fruit. Great salad! I always like a little fresh fruit in a salad. Just makes it so much more interesting. I have started to lean more towards fruit in my salad than vegetables. Even in summer, Colorado never delivers the kind of tomatoes I still dream of from my Midwestern childhood; fruit delivers more than a hothouse tomato any day! I’m so glad Door-to-Door Organics worked out for you Barb! I think it is like a CSA-in-a-box. It offers the ease most people appreciate as well as the end result without driving somewhere for a weekly pick up. The salad sounds perfect. Our weather this summer has been so manic, I feel I’m ping ponging between usual summer fare and something more substancial. This salad with a warm dressing sounds perfect for today. 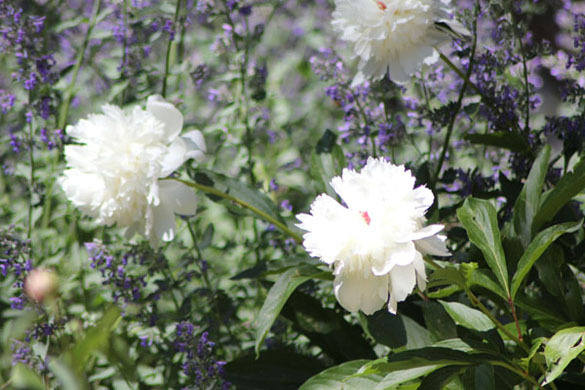 Your garden looks beautiful! That splendid salad is so appetizing! What a symphony of flavors. I love the combination of fruit and bacon in salads. I think I could do bacon with everything LOL! Just adore the flavors of this salad! Lovely flower shots!